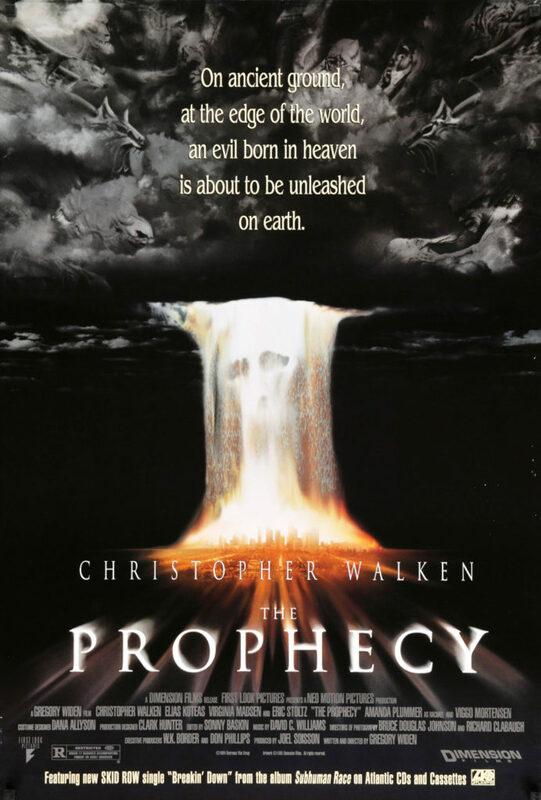 The Prophecy is one in a long line of supernatural films where angels and the devil are real. One thing these films all seem to have in common is the preeminence of the Catholic Church (The Exorcist, Stigmata, End of Days, and others all come to mind). It turns out that not only is Christianity the correct religion, but Catholicism is the correct branch. I don’t know the reasoning behind giving the many branches of Protestantism such short shrift, but I believe it may have something to do with ceremony. If there’s one thing the Catholics have on everyone else, it’s ritual. It gives their church built-in gravitas that the others seem to lack. There’s also a type of military hierarchy that lends itself well to the idea that heaven is structured in a similar fashion, with angels and archangels and seraphim, et cetera. In this film, the war in heaven as described in Revelation and Paradise Lost that resulted in the expulsion of rebel angels from heaven was a real event. But, this film adds to the myth. After Lucifer’s fall, God created the earth, and gave mankind souls. This pissed off a bunch of angels, as man was now God’s favorite creation, and a second war was begun, which still rages as of this movie. An angel by the name of Simon (Eric Stoltz) comes down to the earth from heaven because the Archangel Gabriel (Christopher Walken) is roaming around searching for the most evil human soul he can find. Gabriel needs the soul because he thinks he can use it to win the war. Gabriel is not on our side, by the way. It turns out that angels aren’t harp-strumming pussies, but universal badasses who will visit suffering upon mankind with no empathy. Meanwhile, there are some humans who have gotten mixed up in all this. Elias Koteas (and a toupee) plays Thomas Dagget, a cop who, at one time, had completed seminary school and was all set to become a priest, until apocalyptic visions frightened him away from the church. Alongside him is Katherine (Virginia Madsen), a rural teacher. One of her students has the evil soul hidden within her, and it’s up to Dagget and Katherine to protect her from Gabriel. As for Simon? Well, he turns out to be a bit of an unnecessary character, but Stoltz still did a good job. The Prophecy is just loaded with talent. The ideas behind the film are neat, but feel sanitized for mass distribution, and that affects the cast’s ability to perform. The overall picture is not great. But throughout, there are little vignettes where each member of the cast shines. Stoltz’s confrontation with Walken is great, as is Walken’s entire performance. He’s very...Walken. A viewer can listen to his lines, and it’s easy to picture screenwriter Gregory Widen’s lines being delivered in a way he had not intended. There’s grandiosity to Gabriel’s dialogue that Walken brings down to a more earthly plane. The lines sound like they were written for a performance similar to Charlton Heston’s in The Ten Commandments. But that no longer fit with the era in which The Prophecy was made. Walken nailed it. Elias Koteas is also too good for this movie, but there were only scattered instances in which he could display his skill as an actor. The standout scene for me was when Dagget meets the devil (Viggo Mortensen). The devil wraps his arms around Dagget in a close embrace and a viewer can see Koteas go cold. His character wants to scream. His panic is threatening to break through with every second he feels the devil’s touch, yet he is able to hold it together. Mortensen’s portrayal of the devil was every bit a match for Koteas and Walken, as well. What we have with The Prophecy, then, is a movie that falls short of excellence through no fault of cast or plot. Rather, it suffers because it’s as bland as Pepsi or Burger King. It’s Hollywood. It’s also worth a watch.